Are you looking for a fantastic subcompact car? Look at what the critics say, and it’s pretty clear that the 2015 Honda Fit is a popular choice. But in order to make it as easy as possible for drivers in Mechanicstown to make an informed decision, the team at Middletown Honda has put together this comparison of the 2015 Fit and the 2014 Hyundai Accent 5-Door. Read on, and decide which car you’d rather be driving. 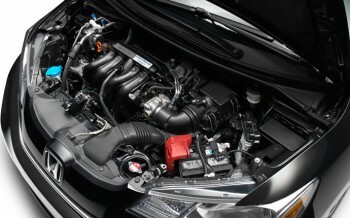 Accent – The 2014 Hyundai Accent 5-door runs on a 1.6L four-cylinder engine that puts out 138 hp and 123 lb-ft of torque. Both six-speed manual and automatic transmission options are available. Fuel economy tops out at 27 mpg in the city and 38 mpg on the highway. Fit – The baseline trim comes with cruise control, automatic headlights, Bluetooth phone and audio connectivity, a rearview camera, and a five-inch display screen. Higher-level trims add features like keyless ignition, a premium sound system, leather upholstery, and heated seats and mirrors. Drivers can also add an optional voice-activated navigation system along with HD and satellite radio. Accent – The GS trim comes with air conditioning, a tilt-adjustable steering wheel, a driver’s seat armrest, and a trip computer. The SE trim adds a leather-wrapped steering wheel and a rear spoiler. Drivers have the option of adding a sunroof, steering wheel-mounted controls, and Bluetooth connectivity. Fit – The Fit has a maximum cargo volume of 52.7 cubic feet and a maximum passenger volume of 95.7 cubic feet. And since the rear seats fold flat into the floor, it’s easy hauling things like bicycles, groceries, plants, or camping gear. With the front seat folded down, you can even carry items a long as 8 feet, a feature that we’re sure Middletown drivers will appreciate. Accent – The Accent has a maximum cargo volume of just 47.5 cubic feet and a maximum passenger volume of 47.5 cubic feet. 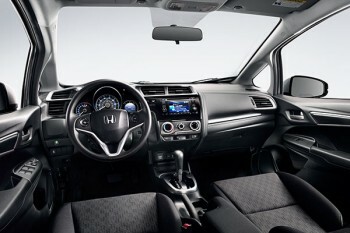 If you dive further into the numbers, it turns out that the Fit offers more headroom, legroom, hip room, and shoulder room, meaning that you and your passengers will have a lot more room to spread out. The 2014 Hyundai Accent 5-Door isn’t a bad car, but the 2015 Honda Fit stands apart. They are comparably priced, but the Fit offers more space, better fuel economy, a longer list of features, and, in our opinions, a lot more style. Check it out in person by visiting Middletown Honda at 520 Route 211 E. in Middletown, NY. We are just five minutes away from Mechanicstown and easy to find right next to the Gander Mountain. Head in our direction, and find out why both drivers and critics alike love the 2015 Honda Fit.